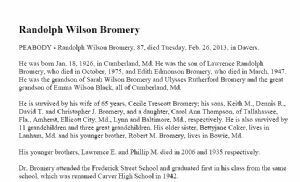 Randolph Wilson Bromery, 87, died Tuesday, Feb. 26, 2013, in Davers. He was born Jan. 18, 1926, in Cumberland, Md. He was the son of Lawrence Randolph Bromery, who died in October, 1975, and Edith Edmonson Bromery, who died in March, 1947. He was the grandson of Sarah Wilson Bromery and Ulysses Rutherford Bromery and the great grandson of Emma Wilson Black, all of Cumberland, Md. He is survived by his wife of 65 years, Cecile Trescott Bromery; his sons, Keith M., Dennis R., David T. and Christopher J. Bromery, and a daughter, Carol Ann Thompson, of Tallahassee, Fla., Amherst, Ellicott City, Md., Lynn and Baltimore, Md., respectively. He is also survived by 11 grandchildren and three great grandchildren. His older sister, Bettyjane Coker, lives in Lanham, Md. and his younger brother, Robert M. Bromery, lives in Bowie, Md. His younger brothers, Lawrence E. and Phillip M. died in 2006 and 1935 respectively. Dr. Bromery attended the Frederick Street School and graduated first in his class from the same school, which was renamed Carver High School in 1942.